Majority of Wahyanites want to get an offer of UGC-funded degree place, but most could not despite their great potential. Pursuing good academic performance is a very tricky task. KODAK, once the biggest and most profitable photographic film manufacturer, went almost bankrupt recently. Do you think the failure of this once great company is due to the laziness of the staff? To avoid failure, we must be very conscientious about what makes something work and what makes something fail instead of looking at the superficial phenomenon or following the slogans being chanted only. For a business operation, the two most critical resources are MONEY and TIME TO MARKET. The top management of KODAK assessed the need of the market wrongly partly because of their history of success, and they wasted their resources in doing something not welcomed by the market. The harder the staff of KODAK try, the faster the critical resources are being wasted and the sooner the company fails. For Wah Yan, MONEY is not a pressing problem. I know many old boys who are willing to donate huge sums of money to the school if the school is well-performing. If they were reluctant to do so, it would simply be because they didn’t want their money being wasted. 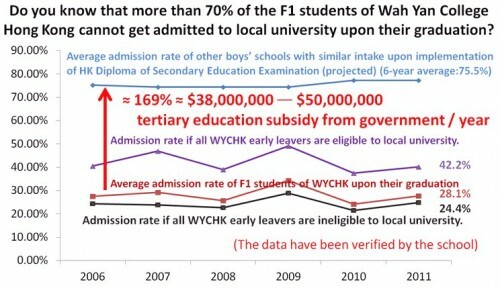 Considering the fact that more than half of the students of Wah Yan are from middle class or above, MONEY is also not the most critical resource to them. The most critical resource to them is TIME. If you have been in Wah Yan long enough, I think you may agree with me that a lot of precious lesson time was wasted in the name of “FREEDOM”. The “FREEDOM” advocated by Ignatian Education is not the freedom to do whatever you want. It is the “INNER FREEDOM” to make difficult choice at difficult time for the greater glory of God and greater benefit of mankind. Alas, many Wahyanites or even staff members misinterpreted its meaning in a way similar to how they misinterpreted the meaning of the school motto. If the school motto is to assure all Wahyanites that they can conquer anything, I think even the most arrogant person in the world wouldn’t dare to assure anybody that. For any ineffective learning practices, the harder you try, the faster you fail. It is the cost-effectiveness that matters. On the contrary, effective measures can only be devised by careful study of present situation and logical deduction. Any emotional reactions will only hamper the chance of improving effectiveness. Then, what do different researchers focused on performance of schools say? It can be seen from the matrix that it is Viable curriculum design, High expectations and Monitoring / Pressure to achieve matter most. I managed to use the Vocablearning platform to help A-Level chemistry students of 2009 and 2011 to double their credit rate and increase the passing rate from about 82% to 97%. However, this had no impact on the UGC-funded degree offering rate of the school at all. It only gave the chemistry students an edge to choose the more competitive degree programs. If the Vocablearning exercise is conducted on a voluntary manner, a similar consequence is expected and the admission rate of the school will strand at about 28-30% level. If you approach any F3 to F6 student who has been doing the Vocablearning exercise persistently for more than 2 years, they will all tell you that it is an invaluable tool to enhance their overall learning efficiency. The project was rejected from the school curriculum for two alleged reasons: 1. Students should be given “Freedom” to choose; 2. Teachers do not agree to include it in the formal curriculum. If Life Education and Voluntary Work can be made compulsory in the school curriculum, I can’t understand why this free exercise can’t be made compulsory as well in order to help the Wahyanites to double their chance of getting a UGC-funded degree offer if the school considers academic performance important. It is the only feasible solution in sight which takes only a median of 10 minutes a day. Does the school give students “Freedom” to choose everything? Say, school-uniform or lesson attendance. There are so many things that the school doesn’t give the students “Freedom” to choose. What should be made compulsory and what shouldn’t ought to be based on the cost and what the school wants to achieve eventually rather than a simple slogan “Freedom”. I hope the “Freedom” treasured by generations of Wahyanites won’t be relegated to a political tool for personal manipulation. As far as I know, the school has never allowed all teachers to make any informed decision on the Vocablearning Project and a referendum among teachers has never been conducted. If most teachers deem academic performance important and realize the presence of the performance gap, I can’t see why they will reject the idea if they have considered all the pros and cons of the project and put the interest of the students first. Reason no. 2 is only a false political claim. In a recent survey conducted by the school, the number of parents opting the project as a compulsory exercise outnumbers the no. of parents opting the project as a voluntary exercise. A very conservative estimation of the investment return can be as high as $2000-3000/hour of exercise done if we consider the earning premium for university graduates and the extra number of students who can be awarded a UGC-funded degree place. The improvement in academic performance also opens more room for the school to do more good things for the greater glory of God and benefit of the society.